Cards for Calm is designed to help you create new ways of dealing with stressful situations and finding more opportunities for happiness in your day. The game helps discourage negative thinking through the use of mindfulness, visualization techniques and creative thinking. Everyone has something they feel they’re not dealing with well. Stress at work or school. Trouble focusing. Bad habits you can’t shake. Poor self-image. The cards in the deck will help you think about the underlying problems and ways in which you can address them. Pick a Question card at random and think about the problem it presents. Have you faced this problem in the past? Do you have this problem now? Read the Answer card to see how you can think your way around the problem. Try the suggested visualizations and see if they help you think differently. Try creating some of your own. You can play a card any time during the day when you feel anxious or negative. See how many cards you can play in a day. Find little spaces in the day where you can take another turn. They can be times when you feel anxious and want to find calm, or want to prepare against anxiety. To start your day mindfully, place the deck on top of your phone before you go to sleep. When you wake and reach for your phone, turn over a Question card instead. Think of how many times a day you check your phone; take just one or two of those moments and, instead, play another card. It can be hard to talk to others about our problems. The multi-player rules of the game help you to present your friends with the things you find difficult, then challenges them to think up creative solutions for you. Each player is given a wildcard, then players take it in turns to deal. The dealer plays a Question card and, if they feel this card relates to an issue in their lives, the card is played. If not, the deck moves to the next player. The issue can be trivial (“I’m online too much”) or something more serious (“I impulse shop when stressed”). When a Question card is played, the dealer explains their problem to the others and the Answer card is read. The other players take turns to suggest a visualization that could help the dealer with their problem. Think creatively when you suggest solutions. Let your imagination run wild. You can give practical suggestions or fantastical, imaginative visualizations they can picture when in the situation. The dealer keeps the Question card and awards the Answer card to the player who gave the best answer. They can also award their wildcard if they loved the answer. When all cards are played, the winner is the player holding the most cards. Cards for Calm was borne out of depression. I lived with the condition for around 18 months before I finally sought help. It then took 6 months of treatment before I was in remission. It’s a long road that must be walked with small steps. Depression is a distorting lens that alters your understanding of reality. With that lens removed, I realized there wasn’t one thing that caused my illness. It was a thousand tiny incidents that I didn’t address. A thousand tiny downward spiral that, together, formed the hurricane that had consumed me. In therapy I learned ways to deal with these negative spirals individually and, with a simple twist, turn them into upward spirals. I continue to use these techniques after therapy and wanted to find a way to share them with others. I began adapting them into a card game, documenting different types of challenges we face in our daily lives and developing visualizations that would help someone change how they approach them. I created a Kickstarter to see if it was something people would like and, 100 backers later, Cards for Calm was born. The Kickstarter led to a few decks being sold on Amazon. Then a few more. Then thousands more. And it wasn’t just individuals who were buying them to help manage their stress and anxiety. Therapists, counsellors, addiction centers, schools, and social workers were also buying them to use with patients, clients and children. 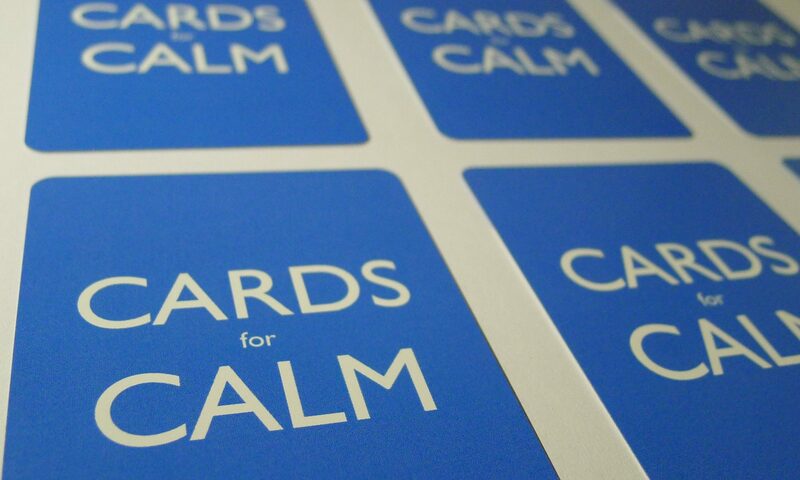 Cards for Calm will soon be available in Canada, UK, and Australia. With so much interest from educators, we’ve created a second version of the game designed for kids aged 10+. Imaginhero takes the same mindfulness and visualization techniques and encourages players to imagine they have superpowers to help them overcome the source of their anxiety. Cards for Calm is not intended to diagnose, treat, cure or prevent any disease. It should not be used as an alternative to professional healthcare. If you feel you are struggling with anxiety, depression or another form of mental illness please consult your doctor. If you’re having thoughts of hurting yourself or others, please call the National Suicide Prevention Lifeline ( 1‐800‐273‐8255) or dial 911 immediately. Help is available. Know that you are loved, and that you are not alone.